Thank Dog its FitDog Friday! This week, we are announcing our participation in the K9Kamp fitness challenge, hosted by our friends Peggy Frezon and Kol’s Notes. 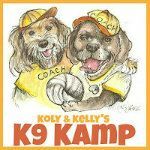 K9Kamp is a blogging event to motivate and encourage exercise and bonding with our dogs (and yes, cats can participate!) We issue a fitness challenge, and you and your dog participate on your own. Then come back and blog about the results. This is open to non-bloggers too. We’ll tell you how. We are participating in K9Kamp because we believe that dogs (and humans) need to be active in order to live a long and healthy life. As we always say, “Movement is life and blood flow means vitality”. We have written many articles about the benefits of exercising your dog and K9Kamp gives people another reason to “get off their butts and workout with their mutts”. We also hope that we and our fellow featured bloggers will be able to recruit a lot of readers to participate so that we can collectively build a group of dogs and people that commit to a sustainable level of fitness- not just for the Kamp, but as a lifestyle. SlimDoggy Jack is a very fit dog! As we have previously reported, he was once borderline obese (and on Prozac) but since we rescued him, he has become a true ‘doglete’ (dog athlete). Jack gets a minimum of 30 minutes, and often twice that amount or more, of moderate to intense exercise each day- mostly running (fast) and walking. Essentially, Jack does a K9Kamp challenge very day! regimens. That means performing speed and directional drills, using resistance (our k9fitvest), and working on our core strengthening programs– and doing these more often during the challenge. We will be monitoring Jack’s activities, calorie burns, and using the Kamp as a laboratory of sorts to see how Jack’s physique and fitness level changes given the changes in his fitness programs. Join us! Every blogger and reader who has a dog should make every attempt to tackle the challenge. We will be accepting reader stories about their challenge experience and will publish these on our site. SlimDoggy will also offer – to the first 20 participating readers – a free SlimDoggy App. Simply fill out the form below and we will send you a special code to redeem in the Apple app store. SlimDoggy will also answer all of our reader questions that are related to participation in the challenge, including questions on different types of exercises, and food serving and ingredient questions. Questions can be submitted via comments or the contact us form here. Thanks again for hosting this FitDog Friday! We are so excited to be part of it as well as the K9 Kamp – paw up for pet fitness! And we’re glad to have you Emma & Katie. FitDog Friday rocks. And we look forward to being part of the K9 Kamp…..great ideas both of them! Thanks – we’re pretty excited about all that’s going on for fitness too! And thanks for the Instagram tips! Jack can be like an awesome counselor who shows the youngsters how to be a super hot stud running dog! Thanks for joining us at K9 Kamp!! Yay! We’re ready for Kamp too! Diane recently posted…It’s a FitDog Friday and K9 Kamp Mashup! Happy FitDog Friday! Daisy and I are looking forward to K9 Kamp with you and all the other Kampers! Woof Woof Mama recently posted…Join Us for K9 Kamp and Get Fit with Your Fur Kid! This K9 Kamp sounds great! We have already been trying to step up our workout programs in our household, so we are looking forward to even more ideas and inspiration! Awesome! With Kol we fell into a bit of a “fitness routine” and we all got bored. We’re excited to see you guys incorporating some new ideas. Can’t wait to hear how it goes! Thanks for kamping with us! Great to see you guys at Kamp! Also great to see your site up and running again after the hack! How did you get it back? I’d be stumped I think! Oh, Snoopy, it’s a long story…and a long night. We’ll blog about it when the dust settles. We plan to add some SlimDoggy swag to the mix – so you could be a lucky winner of a SlimDoggy scoop or frisbee! We’re trying to think of something we can do for the challenge. I hike for a couple hours 3-4 times a week and walk for 30-60 minutes on the other days, so I don’t really need more aerobic exercise, but I could use some strengthening exercises. So I’ll be trying to do more core strengthening work with my FitPaws ball. That should be entertaining! We have the same issue with Jack – he’s pretty fit already,so we plan to do the same – increase the diversity of what he does. You have to be careful when you’re injured. Tell your mom not to give you so many treats 😉 or switch to carrots – we love carrots.